Lavender bags to buy online in a selection of sizes and designs. Coming from the lavender fields of Provence, the lavender we use is high in essential oils, and therefore highly fragrant. The bags can be used as an insect repellant in cupboards, to freshen drawers, or to aid sleep and relaxation. Our lavender bags make very popular wedding favours, and are hand-filled to order using only dried lavender (no cheap fillers). Our hand filled lavender bags can be opened and refreshed when needed. Now selling empty bags to fill at home! 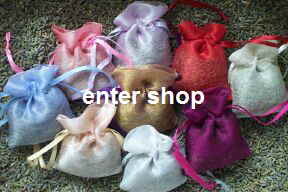 Lavender bags are also available in bulk packs suitable for use as wedding favours or for re-sale. The more you buy, the better the price. Our 100 unit packs are available at a wholesale price to all. Larger orders accommodated - please contact us. Empty bags - fill as you wish. Dried lavender loose - make your own lavender bags! To buy a lavender bag, just click on Enter Shop above to visit our online shop at www.daisyshop.co.uk, where you can browse our product range and pay securely. We accept Visa, Mastercard, Maestro, Visa debit and PayPal.